Of the many attempts to create technology hubs all over the world, few can be as audacious as the example of Yachay, a new ‘city of knowledge’ being bankrolled to the tune of a reported $1bn by the government of this mostly Spanish-speaking south American country better known to outsiders for its Inca history, colonial architecture and spectacular biodiversity. Home to more than 15 million people and with the region’s eighth-largest economy, Ecuador is generally seen as a mid-table Latin American country in wealth and standard-of-living terms. Its purse is boosted by crude oil which accounts for about two-fifths of its exports, and which aids a trade surplus and steady growth. It also banks in US dollars after a currency crisis in 2000 and has a democratically elected government, even if there are familiar concerns over the regime’s record on free speech and its prickly relationship with the US. Countries such as Chile and Peru have set the Latin American standard for creating technology startup opportunities but Ecuador is attempting something on a faster track, a combination it says [YouTube video] of “research, innovation and production” or, you might say, a superset version of the classic tech hub, a blueprint vision in a city. It is building a research university and plans to extend this with a business park, labs and incubators… nothing less grand than a new smart city designed to appeal to a new generation of Ecuadoreans and foreigners and even tourists keen to extend an itinerary based on ruins, exotic creatures and rainforests. Its plan is to provide an ecosystem under which the big challenges of our time — energy, biotech, agriculture, industrial automation, disease-beating drugs and so on — can be attacked while at the same time expanding skills, knowledge and attractiveness to academics and business people. It’s the sort of thing you might expect in the fictions and fables of a Latin American writer like Jorge Luis Borges or Gabriel Garcia Marquez. Back in the real world you might expect it in the Middle East or Asia but less so perhaps in Urcuqui, a small town in a valley more fertile in vegetation than technocratic schemes, located about 50 miles from Ecuador’s capital, Quito. 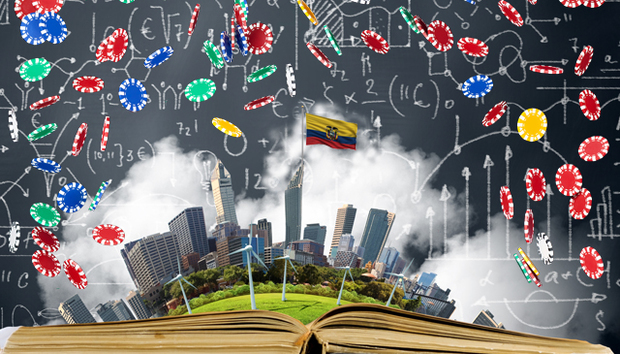 This attempt at creating a one-stop shop for technological cultivation, research and wealth/jobs creation is to some extent the personal project of Ecuador’s President Rafael Correa. President Correa has quite a cosmopolitan outlook. He met his Belgian wife when studying there and he is said to speak French, English and Spanish but also Quechua, the language of the indigenous people of the Andes which provides the ‘Yachay’ name, meaning knowledge. In Spanish, it is often referred to as the ‘ciudad de conocimiento’, or ‘city of knowledge’. The Yachay project may reflect the influence the US had on Correa when he took a master’s degree in economics in Illinois in the 1990s. Certainly, Yachay has echoes of Silicon Valley or even Las Vegas, that great man-made tribute to entertainment. And just as technology allowed the Valley to become known for something other than fruit farming, Yachay is intended to allow Ecuador to wean itself off dependency on oil and secondary activities like agriculture. Yachay, although it might sound suspiciously like a vanity project, is in keeping with Correa’s infrastructure-building policies that have delivered roads, schooling and fast internet speeds on the back of tax-raising exercises such as a hikes in the cost of mobile spectrum for carriers and a sweeping redrawing of debt programmes. There are many outspoken supporters of the scheme. Of course, such ambitious projects involve plenty of risk and some potential partners will doubtless have broad doubts about Ecuador, thinking perhaps of its harbouring Julian Assange of Wikileaks in its London embassy or the odd episode where Ecuador strained US relations by offering Edward Snowden travel documents. President Correa later said this had been a mistake. But, in a globalising economy, American largesse might not be a must, and if Ecuador gets its package of incentives right and creates the right alliances, it could prosper. And if President’s Correa’s project comes off, Yachay could provide a massive opportunity as success would breed more housing, services and leisure opportunities in an area of outstanding natural beauty. Yachay is a hugely ambitious project but then the technological rise of countries like India, China, Israel and South Korea would once have been thought of as pipe-dreams too. « eCourts: Justice Pending in India?